I love getting a mix kebab (donner+chicken tikka+sheekh) over the weekend. But at a £5 price tag it is expensive. While I love donner kebab its also very fatty and unhealthy. 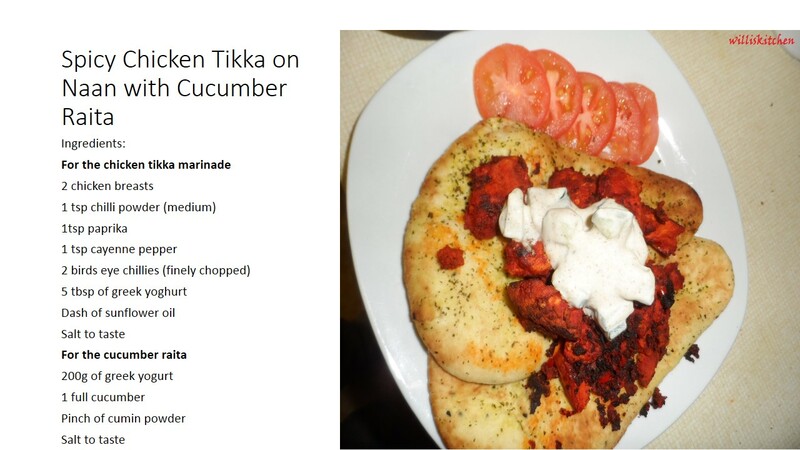 Today I wanted to make my own takeaway meal with the chicken tikka on naan making it a good takeway meal to indulge on. I should mention the recipe was spicy with some sweat streaming on my forehand so I if you can’t handle spice very well half the spices to make it mild. Cut the chicken into bite size pieces and mix the chilli powder, paprika powder and cayenne pepper to the yoghurt to make it into a paste. Add the birds eye chilli to the paste and add the chicken pieces and marinate for 4-6 hours. On a hot pan add a slight dash of olive oil or sunflower oil and fry the chicken pieces on both sides. Grill the chicken on a medium grill for 10 to 15 minutes. For the cucumber raita cut the cucumber into bite size pieces and mix it with the yoghurt and add the cumin and refrigerate it for an hour. I made the raita the same time as the marinade. Serve with salad or eat on its own. Although the chicken was spicy I just used water to calm my mouth. How do you combat spicy food in your mouth, do you use water, milk, milkshake or just water? A few days before the New Year and like every other person on the face of the earth I decided on some New Year resolutions. Losing weight, getting more exercise blah blah but one resolution was to post more on to my blog. 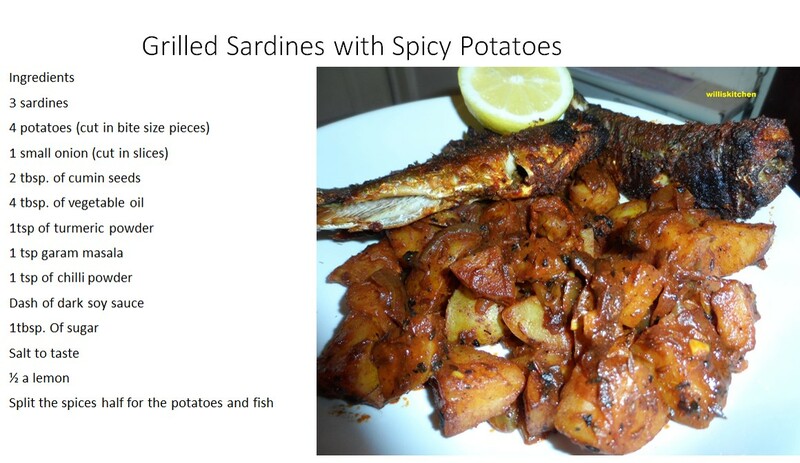 My first recipe for 2014 is the Grilled Sardines with Spicy Potatoes. The recipe is very simple and does not require much ingredients and effort and perfect for the mid-week. I have been looking to incorporate some fish into my daily meals mainly oily meals due to the benefit of the fish on type 2 diabetes and reducing heart disease. Sardines are very cheap and you can get them at almost at any supermarket, although just before the New Year and after Christmas I found it hard to find in my normal supermarket but is abundant right now. In a bowl mix the turmeric powder, chilli powder and garam masala and salt with a dash of water to a smooth paste. Pour the marinade over the sardines and let it marinade between 30mins to 3 hours depending how much time you have. I marinated for about 45 minutes. Pre heat the grill to high and place them on a baking tray and grill them for 20 minutes. 10minutes on each side. Heat the oil in a non-stick pan and add the cumin seeds when the oil is hot. The cumin seeds will sizzle once added, add the potatoes to the pan and keep stirring. Once the potatoes are part cooked, check by sticking a fork then add the onion. After a few minutes add the spices and let it cook for a few minutes. Add about 200ml of water and let it cook for 5-8 minutes on a low heat. Then add a dash of soy sauce and sugar, mix all together and turn the heat off in 2 minutes. I would love to hear of ways you cook the fish and if anyone has ideas how to strip the bones especially the minute ones within the flesh?